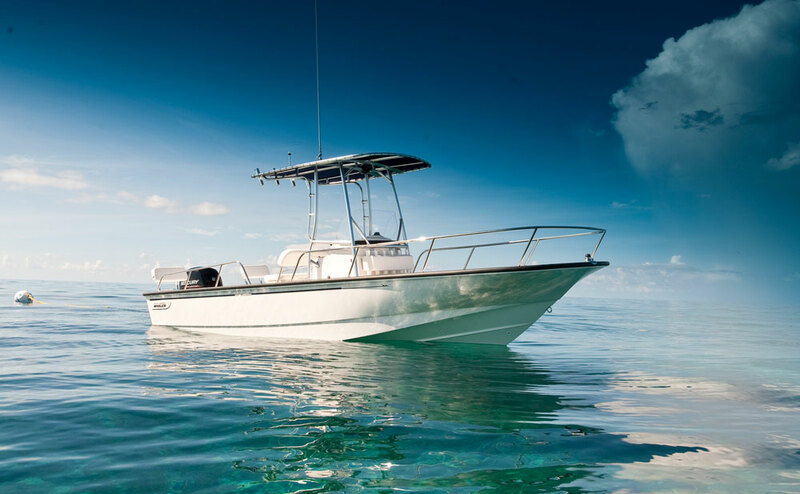 In 1958, Boston Whaler astonished the world by introducing a boat like no other -a 13-foot craft built with totally unsinkable UnibondTM construction. Today, we continue to pioneer innovative technology for boats that are purposefully engineered for safety, reliability, low maintenance and ever-more-useful features. 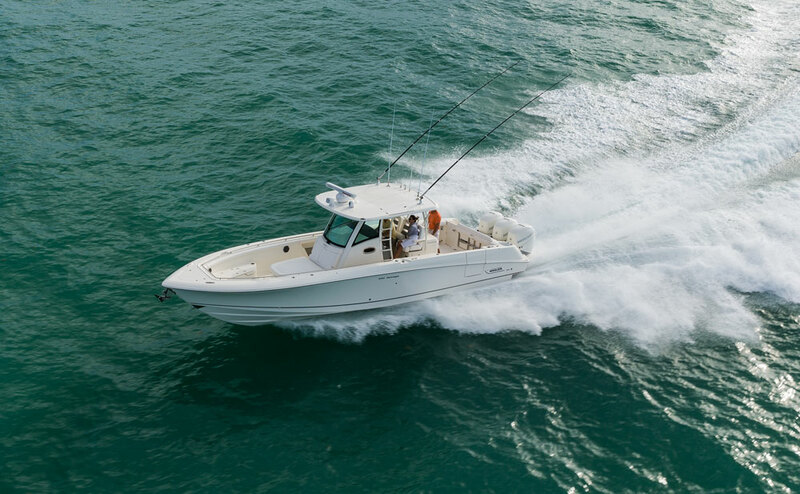 From our smaller fishing boats for inshore and backwater fishing, to our sleek center consoles to take you to offshore fishing grounds or your favorite watersports spot, to well-appointed cabin boats for fishing, cruising and entertaining, we do more than create boats. We create experiences. The kind you and your family will enjoy for a lifetime of safe, carefree boating - spendingyour time having fun and not worrying about the boat. Take a look at our product line and learn how we build these remarkable boats, and you'll see why Whalers will be the smart choice for generations to come. There are moments that become memories for a lifetime. And more than a few of them come from the time you've spent on a Whaler®. Like camping on a quiet island with family and friends. Reeling in that 90-pound sailfish with your college buddies. Watching your grandchild get up on skis for the first time. Whalers are meant to be enjoyed by every generation in your family. And built to last through generations of spirited use. Electronics and lights that work because we use insulated tinned copper wiring for its superior corrosion resistance; the fact that ice and your fresh catch last longer in a Whaler because our unique foam-filled construction results in fully insulated fishboxes; and when you move about the boat, there are strategically placed grab rails to help you along. And, of course, there's the peace of mind knowing you're in an unsinkable boat because of the Unibond™ construction you get only in a Boston Whaler®. 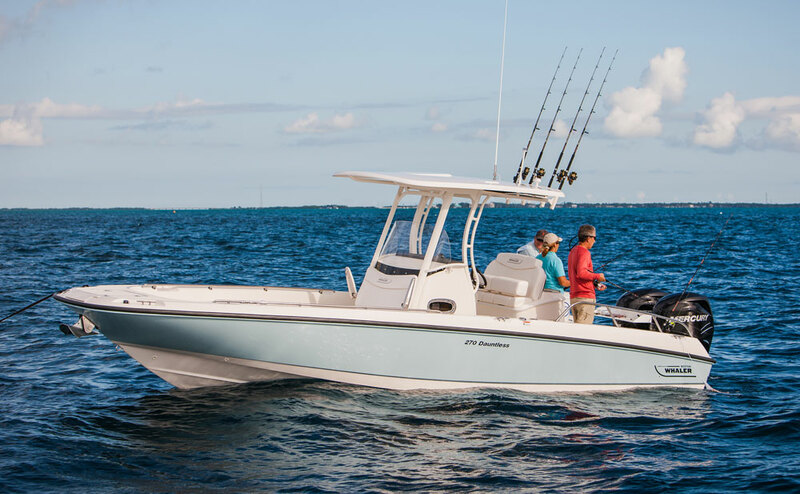 But there's a softer side to Boston Whaler in contrast to the heart-pounding, adrenaline-pumping quest for bluewater monsters. 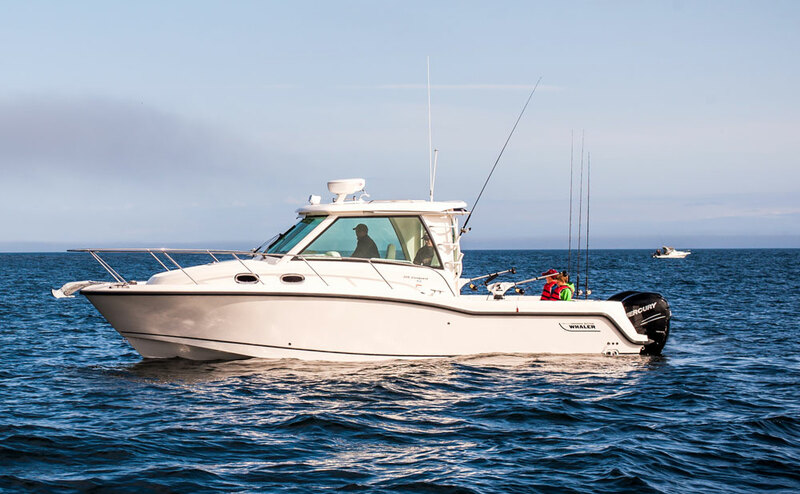 Unlike some other fishing machines, Whalers actually provide seating for anglers to enjoy during the journey to and from the weed lines, or for your crew to lounge while traveling to and from your favorite waterfront restaurant. 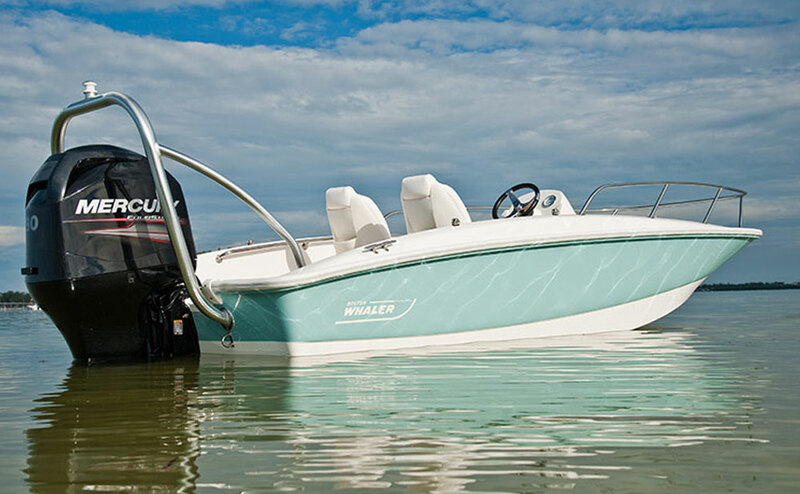 Whatever you do to relax, we have a Whaler model designed to make it more enjoyable. We even have options like coaming pads for the gunnels so you don't take a beating when the fight is on. For those boaters who enjoy cruising or watersports, our designs include cushioned sun lounges, sun tops, ski pylons and other options to keep you comfortable while you enjoy your precious free time. Purposefully engineered to be safe, functional and low maintenance. Unsinkable Legends are not just built but also created by people who are passionate about the customer experience. They're the best and brightest in the boat-building industry. They design, build, purchase and inspect. They work on the marine industry's most advanced computer design programs, in the factory and in the office. They have different skills, different responsibilities. But they all have one thing in common: To build boats where all elements merge to provide a totally rewarding experience for the Whaler customer. This requires an uncompromising commitment to total quality, absolute safety, outstanding performance and trouble-free operation. Our engineers also make sure that your Whaler is designed for the ultimate in low maintenance. The idea is for you to get away from work when you go boating. You shouldn't have to spend hours cleaning after spending time on your boat. You won't find a lingering fish odor in our fishboxes because Whaler compartments have high-gloss, smooth-finished gelcoat interiors that simply wipe clean. Even the hatches are finished on both sides. Our cushions are designed to last longer and look better because we use premium prefix vinyl made for marine use with a mildew retardant and UV inhibitors. And to reduce the risk of rust stains and corrosion, our fasteners are chrome-plated stainless steel. We work hard to ensure you don't have to. Most boaters are familiar with the fact that you can put a hole in a Boston Whaler hull or cut it in half and it will still float. We've even piled 20 people into one of our 19-footers to demonstrate its remarkable buoyancy. The unsinkability of our boats afforded by our exclusive Unibond construction process is legendary. But the foam provides more than just flotation. Sandwiched between two walls of fiberglass, our high-density, non-absorbent foam provides structural support and sound and vibration absorption in addition to unsurpassed flotation. This means you have a solid hull, not hollow like most other boats. You can literally hear the difference. Pound your fist on a Whaler hull and then on the hull of another brand. If the hull sounds like a bass drum and flexes, imagine what it - and you - will be subjected to in rough water. You can literally park a 32-ton dump truck on a Whaler without crushing it - that's how strong these boats are. We have a wall of fiberglass on the exterior, dense structural foam in the middle and an additional fiberglass wall inside. We have so much confidence in this construction we offer a ten-year transferable limited hull warranty. 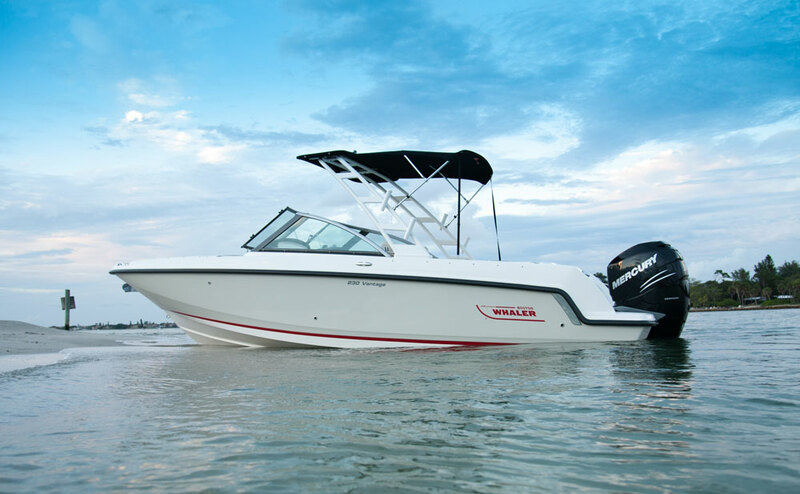 That means that when you sell your Whaler to move into a newer or larger model, you can offer the new owner the remaining time on the warranty. Some boat companies that claim “level flotation” may not be leveling with you. A Whaler's level flotation is truly level. Even if it's swamped and drastically overloaded. Whalers have up to two-and-a-half times more foam than is required to meet Coast Guard standards. Every bit of space in our Unibond hull is filled with closed-cell foam providing strength, sound and vibration absorption and, of course, flotation. Whalers float level because the foam is positioned in the hull right up to the gunnels, so a swamped Whaler provides a protective ring around its passengers. Speaking of rough water, you won't find a smoother, drier-riding boat than a Boston Whaler. The deep-V entry of our Accutrack™ hulls cleanly slices through unruly chop. Then reverse chines redirect the spray to the water's surface so you and your passengers remain dry. Other boat hulls may slice the waves but they have no provision to stop the waves from washing back into the boat. If you've ever been on a boat that forced you to wear foul-weather gear, even when the sun was shining, you know how important this is.